#ad: This is not a compensated campaign, however an Influenster #Zzzquilvoxbox was sent to us for editorial consideration. Full Disclosure Below. I am a lifelong insomniac. I have tried everything, hot baths, turning off digital and the TV, meditation, you name it I have probably tried it. While I was much younger it was great, I could read, get more studying done, cram for exams, write reports, etc. As I got older and entered the workforce, my insomnia would let me work into the night, moving me ahead quicker. And working in International Corporations this proved useful as conference calls needed to happen in the time zone that was best for the client. Often times wee hours of the morning here in NYC. As a blogger, most of my writing is done during 'graveyard' hours when most of the world is asleep. (Not that the noise level goes down very much in New York City, but it dies down enough to concentrate a bit better late at night). I have to say all these sleepless nights are starting to catch up with me. They affect my mood during the day, and I tend to graze more to keep my body fueled as I am not quite giving it the rest it wants, needs and deserves. Perhaps all my late night insomnia tweets got noticed because when I found out I qualified for an Influenster #ZzzquilVoxBox I definitely jumped at the chance. Was someone reading my tweets and reading my mind? So tonight I am going to try these. I will report back to you all later, I have been secretly testing various 'natural, non-habit forming' supplements (on my own dime by the way with the exception of these) and have one other thing I want to test and then will come back to you guys with a full even-handed recap of my progress and results with getting a better night's sleep! And as always, another (NON) Wordless Wednesday was had by all. Bloggers you can drop your Wordless Wednesday Link in the comments, but absolutely, positively NO Giveaway links allowed. I will check. And if you do not comply a black Escalade with tinted windows will pull up to your house. :) (joking, not joking). Giveaway Alert: Don't forget to check out our latest giveaways! Want to win a $100 Gift Card for YOUR choice of TinyPrints or Shutterfly? Then enter to win HERE quick! Butterflies/Readers: What helps YOU to get a good night's rest? FTC Disclosure: This is NOT a paid campaign, no monetary compensation has been offered. 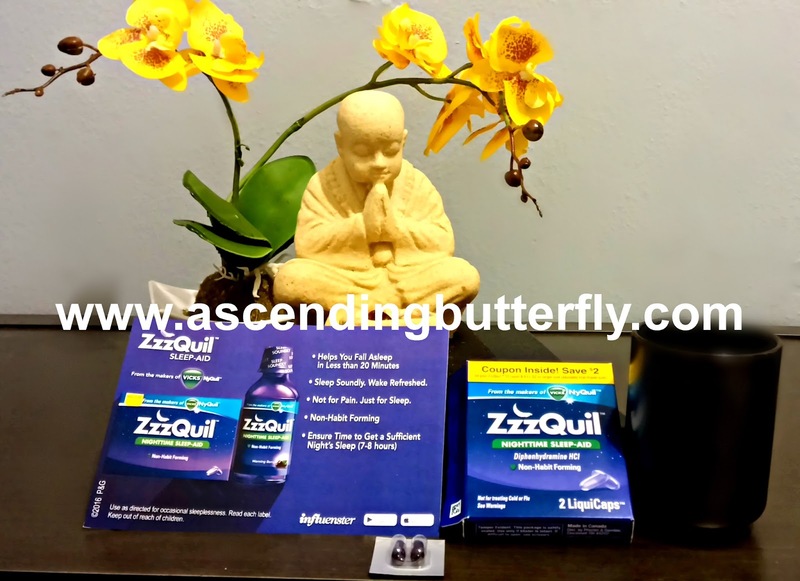 Ascending Butterfly is a member of Influenster and Influenster boxes are randomly sent to members (bloggers as well as non-bloggers) for editorial consideration and our honest opinions of the products. All opinions expressed herein are 100% my own. See our Giveaway and Disclosure Page for full information. Zzzquil is awesome. I know that when I take it I won't be groggy the next day. I hope you're able to get some sleep. That's horrible that you can't sleep at night. Lately I've been hit with a lot of asthma, and haven't been sleeping well. I hate it. Tracy, my DH has trouble falling asleep and then staying asleep through the night. So, I sort understand your struggles. I have problems waking up sometimes during the night and can't fall back to sleep quickly. That's so aggravating. This is related to stomach problems I suspect, and probably is DH's problem, too. I will eagerly look forward to your review. Have a funtastic week! I just recently switched to Zzzquil and love it. I too suffer from Insomnia and after trying a number of things, like you, I finally settled into Zzzquil. I love that I wake up feeling refreshed in the morning and I am able to sleep through the night. Good stuff! I sometimes have trouble sleeping. I have heard of Zzquil before. YES the struggle is real. We use Melatonin for my youngest and it works. I have heard of ZZquil but haven't tried it yet. This sounds like a great product to try out when having trouble sleeping. Lately I think all that is on my mind is keeping me awake! I hope you are able to get more consistent rest. I missed sleep for sickness and it was the worst. Oh, wow. Insomnia is a serious thing. We all need a restful sleep at night. I hope Zzzzqui will help you although I've heard melatonin is a better option. Nyquil is the only thing that gets me through cold and flu season so I'm sure Zzzquil will help me with my bouts of insomnia, as well. I don't know if I'm an insomniac. I can fall asleep. I just wake up at 3 a.m. for no reason like clockwork. Maybe Zzzquil can help. I had horrible nights too! I hope you will have a good night sleep in the coming days, keep healthy! What helps me get a good nights rest is listening to meditative music or good old fashion read a book until I am sleepy. I seen a lot of people get this particular influenster box great review so far. I have tried everything under the sun to help with my sleeping issues including scripts and OTC. I have yet to try this because I am thinking if nothing else has helped, this probably wont either. Now I am wondering if it worth a shot. I haven't tried anything similar to that effect but I hope it helps you. I tend to do and feel the same whenever I crunch at night and start to drown at day. I have some really bad issues with insomnia, as well. I will definitely have to look ino this. I am also a terrible sleeper. I hope you find that the zzz quill will help you sleep better! I tend to be a night owl too. It's so hard. I typically stay up or wake up in the middle of the night due to pain. It's awful. I have to get some of those Zzzquil for my mom and my husband. They have difficulty falling asleep at night. This might just be the solution to their problem. I've never tried this product before. I hate getting sick with the cold. It's such a pain. Glad to hear about this product though. I'll have to get some the next time I get sick. These are essential this summer and beyond too. ZZQuil is always a favorite brand of mine! Zzzquil was recommended to me before when I had a hard time sleeping after moving here in the U.S. from Asia. :) Never got to try it, but I was told it works great. Ugh, I hate having to get up early to go anywhere because I am just starting to actually fall asleep. I know the struggles! My wife and I always use a white noise maker at night to sleep. This, combined with the sound of a fan and the AC unit, helps us to fall asleep. I use this sometimes and it works so well. If I have a couple nights of unrest, I'll use that the next night. I have never tried this, but I do sometimes have sleepless nights. I would love to be able to try something like this, but I'm afraid it will knock me for a loop and I won't be able to wake up in the morning, lol. Can't wait for your results . I've always had trouble sleeping .I've never tried Zzzquil . Oh, I am having insomniac attacks especially that my son is turning three. I will try this. I'm so happy to read this! I struggle with insomnia from time to time, but I'm always so nervous to take something since I have to be up with the kids the next day. Good to hear that it works and won't leave you run down the next day! I'll have to look for this the next time I'm out!